Coming out of England, Dogstar Poets were constructed by former members of Jade Warrior. After successful album releases over the decades David Duhig: Guitars, Keyboards, Secret Sounds, and Electronic Percussion. Glyn Havard: Vocals, Bass. Along with Allan Price: Tablas, got back together after a twenty-year gap. Relighting a spark of years past, they enlisted David Lewis: Drums and Acoustic Percussion and Brian Imig: Hammer Dulcimer, to record under the name Dogstar Poets. The record company informs us that Off Planet will appeal to those who like great rock music, which is concerning. After all some folk think Brian (F***ing) Adams Or Bruce (Born in the USA) Springsteen are top draw rock acts. In reality though, they are both paplash, I feel that I have a duty to divulge the truth. We’ll see how it goes? Off Planet is an eight track CD, lasting nearly fifty minutes. It starts with ‘Burning Bridges’ a throbbing Bass number. Guitar wise it is very Frank Zappa in ways, David Duhig lists Hendrix as an influence and I can hear it in there, Glyn Havard’s Bass and David Lewis’s Drumming provide the right structure for the Guitar to work its magic. This is the theme throughout the album, sort of free form jam style stuff on the solo’s, interesting. ‘Karmakaze’, possibly Steve Hillage in music until the vocal comes in, then it turns towards Quintessence or Golden Avatar maybe even The Strawbs. I mention these bands because their lyrical content also leans heavily towards the mysteries of the worlds away, probing existence as inorganic energy, as anti material forces, the overselves, the true spiritual nature of man, salvation, Bla de Bla. ‘Avalon Mists’ is a Tabla percussive song, wedged almost ritualistically in the mists of Avalon, very mellow and floating in sound. At times, I hear late 70’s Pink Floyd; it is probably the guitar whammy bar played chords, as well as the atmospheres and ambiences. ‘Turn This Wave’ is similar, good Guitar noodling, Brass Keyboard sounds playing randomly spoil it though. That happens on a few tracks. As far as the songs go ‘Magic Mile’ is my favourite, I like a few mellower ones as well, but this one is up-tempo, again it could be Zappa. That’s probably why I like it. 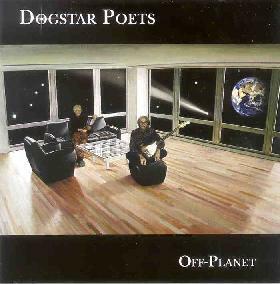 Dogstar Poets tracks have definite atmospheres, keyed for improvisation fiends when they get going after odd verses of Vocal. All members of the band are talented musicians; Guitars can not be faulted, Bass and Drums nice and tight. The Hammer Dulcimer sounds beautiful inside the effected/delayed/weird structure of a couple of tracks. The Keyboards hold the frame as the Tabla shines on the odd song. I just don’t really like much of it personally, when the Vocals are finished in certain songs I’m happy. Sorry I’m not a big fan of what you could loosely term very middle of the road Prog Rock. If you are, then you should like it.